Over Polmadie Burn west of Rutherglen. NS 602 630. Ponts Renfrewshire original shows what appears to be a crossing on this burn - it does not appear on Blaeu. This is likely to have been on a route between Rutherglen and Glasgow. It is worth noting that Polmadie was one of the original toll points for Rutherglen which may indicate an early route through this area. Old Priory Bridge near main road between Hamilton and Glasgow. NS 6782 5841. Hamilton to Glasgow - this appears on Roy. Although the bridge is not thought to be earlier than the 17th century, Pont could be showing an earlier bridge or a ford. There is no tradition of a bridge having being built by the monks so the name may just refer to it being close to Blantyre Priory, which was established by monks from Jedburgh. 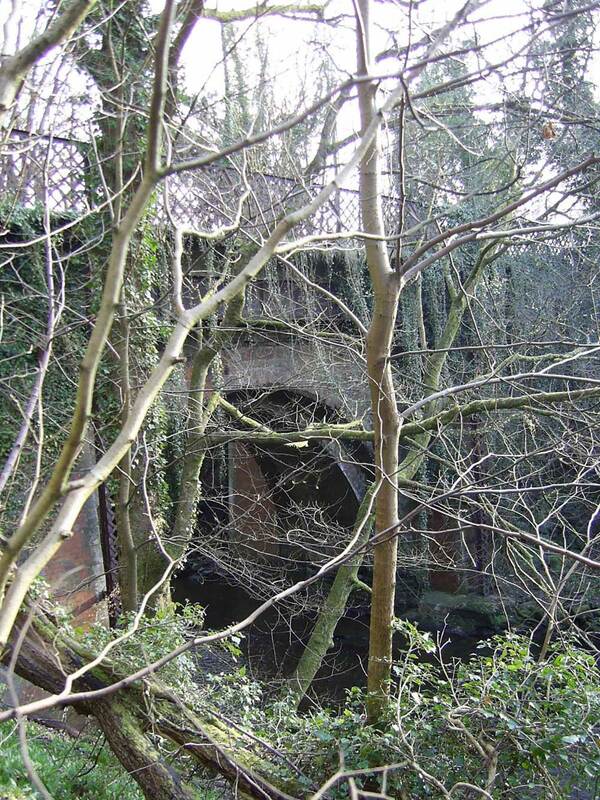 As can be seen from the photes the approach road is badly overgrown and the bridge itself has trees growing on it. The different phases of the bridge as mentioned in the NMRS record can be seen by clicking on the second photograph. Other image. 2. Kaldar - second crossing on River Calder near Kaldar. 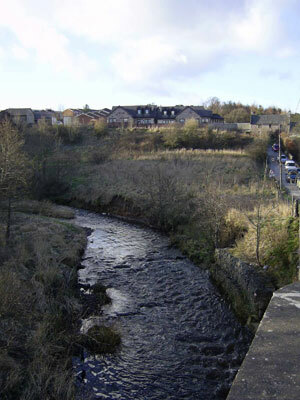 Given its position downstream from the confluence of the Calder with the burn running from Nerston it is likely to be on the minor road from Flemington through Barnhill to Blantyre (present High Blantyre). This road with a bridge is shown on Roy. The present day bridge is of fairly recent date but the river (see photo) could be forded hereabouts although there would be steep slopes to negotiate on either side of the river. NS 677 574. From the route shown on Roy the most likely explanation is that this developed as a slightly quicker route to Glasgow by heading directly for Flemington rather than joining the Hamilton - Glasgow route near Priory Bridge. 3. Calderwood Castle - third crossing over River Calder near Calderwood Castle. It is just above the confluence of the burn mentioned in 2 above. 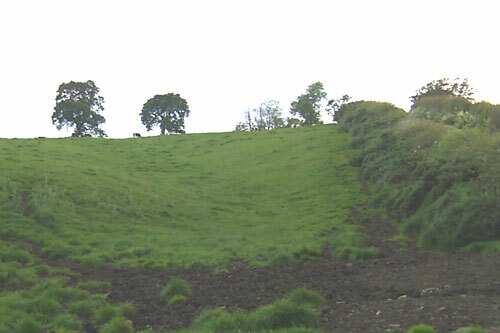 While it may have been connected with the castle (near Craigneath Castle) it is more likely to have been at Crossbasket where Roy shows a route. 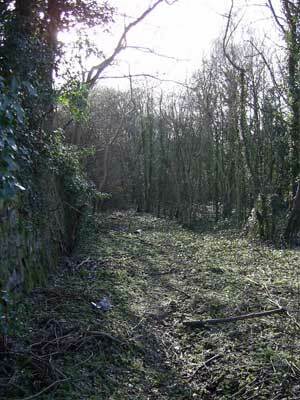 The eastern approach to a ford would have been steep but it is more level on the other side of the river. NS 667 565. In Roys day this was the only crossing between the (East) Kilbride area and Blantyre with routes beyond these places to Eaglesham and Ayrshire and to Bothwell Bridge and the east. Pont does show Bothwell Bridge but in the absence of confirmatory evidence we cannot assume that any long distance route existed in his time so it is safer to assume the more local route. Given its proximity to Torrance and being downstream from the Rotten Burn this was probably near present Newhousemill although his Newhous is not shown as a mill. NS 655 534. 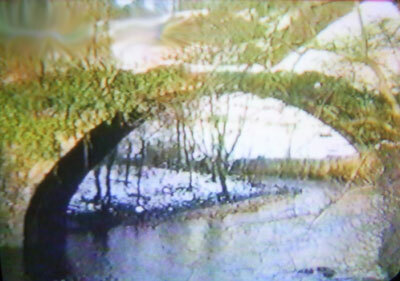 The bridge as shown above does not appear particularly old although it is very narrow. 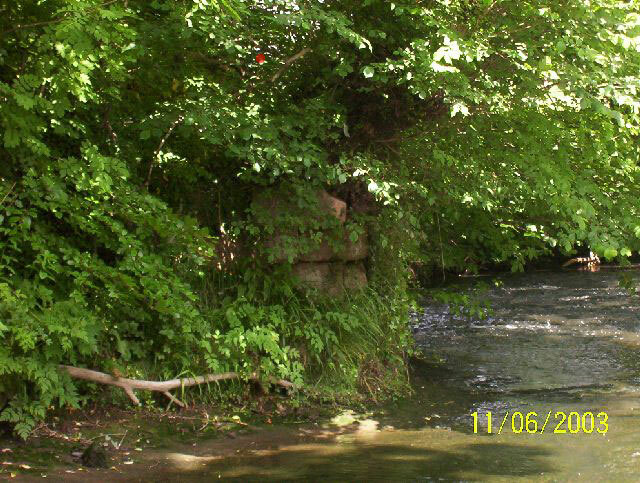 The second photo shows the most likely spot for a crossing as other locations upstream and downstream have steep or near vertical approaches. There is no sign of approach roads on either side of the river. No road is shown on Roy so it may just have allowed nearby farms to access the (East) Kilbride area and beyond. 5. Hamilton - first crossing on River Avon near Ross and Haughhead. 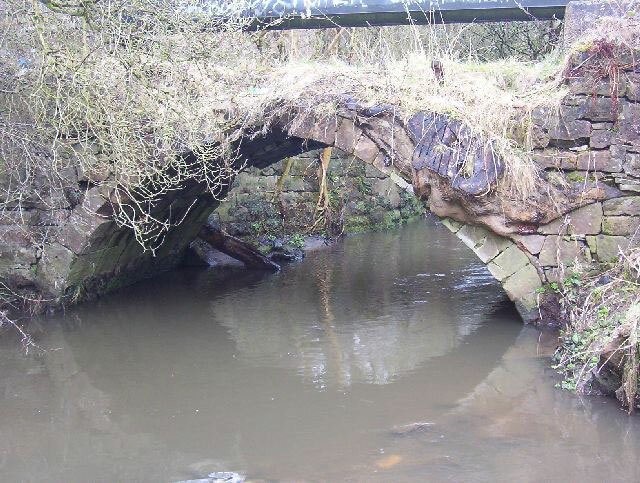 Old Avon Bridge - one mile sw of town centre close to A72. On Ponts original map this is clearly shown as a bridge. 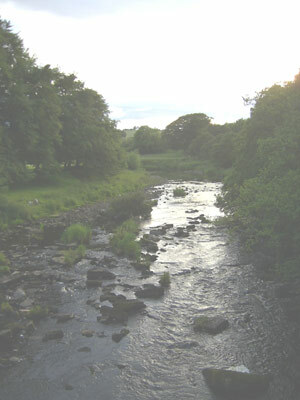 Although it is shown as downstream from the Barncluith Burn all the evidence points to it being the Old Avon Bridge which was upstream from this burn. The bridge itself (it has been extensively restored) is said to have been built by the monks from Lesmahagow Priory. NS 7332 5463. See NMRS NS75 SW9. Although we cannot say with certainty what the original purpose of the bridge was, it is clear enough that by Ponts day it would have facilitated travel north and south of the Avon, certainly to Lanark via Crossford and to the south. By the mid-1700s the main route to the south passed over the bridge. Bridgeholm on A712, 2 miles east of Strathaven. NS 733 455. This is a puzzling crossing. Roy shows a route from Lesmahagow to the crossing and, north of that, a road running past Glassford Kirk which runs only for another two or three miles to terminate at Thinacres. There is no Strathaven - Stonehouse link nor with Hamilton to the north - in any case there is a more direct Hamilton - Lesmahagow link through Larkhall. It is hard to account for the Lesmahagow link unless it goes back to the Priory in the middle ages. The only other reasonable explanation would be access to a mill or to Glassford Kirk. 7. 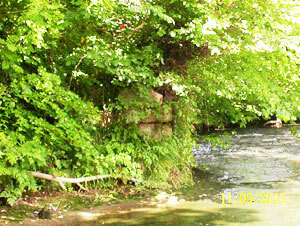 Barncluith Burn running into River Avon near to Old Avon Bridge. Near Barncluith, south of town centre. NS 729 547. It is shown on Ponts original map as a ford, i.e. the road line goes through the river. The 1850s 6" OS map (sheet XVIII - NW corner of sheet) shows a ford here. 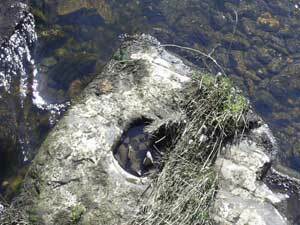 It is unlikely that this crossing being so near to the Old Avon Bridge was of more than local use, perhaps to give access to Barncluith. This was on the route between Hamilton and Lanark which crossed the Clyde at Crossford. Thomas Reid (Fords, Ferries, Floats and Bridges near Lanark, PSAS, Vol.47, (1912-13),page 235) confirms a route here in 1650 when Cromwells forces were in the area, and the route is shown on Roy circa 1750. Craighead, at Lesmahagow. This is probably the bridge located at NS 814 404 (access just south of filling station). There is a later bridge just to the north of this one. Although on Roys map this is on a north-south route and would also have given access to Lanark we cannot say that this was the case in Ponts day, although likely enough. May just refer to a hospital run by the Priory at Blantyre, although it is on or near to a Hamilton to Rutherglen/Glasgow route. Sandford. It is uncertain if the name refers to the Avon or the Kype Water. The village is 2 miles south-east of Strathaven. 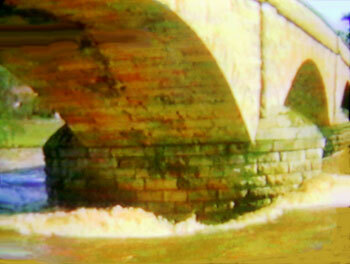 The photo shows the old bridge (later than Pont) over the Avon. NS 720 430. 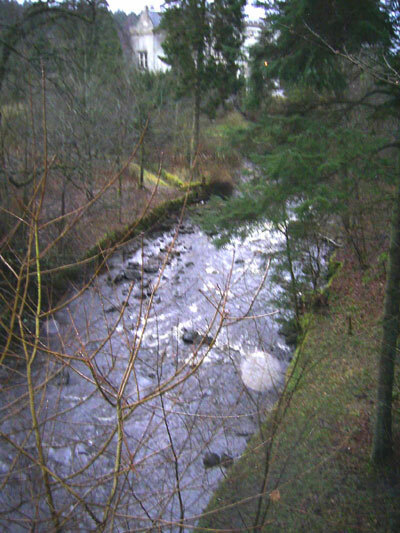 This is on the Strathaven - Lesmahagow route shown by Roy. We cannot say with certainty that this route existed in Ponts time although in his lists of distances there was a route between Ayr and Lanark that must have passed through here or nearby. At the very least the ford would have allowed access to Strathaven for local farms. Spittal, two miles north-west of Blackwood. NS 773 448. It is not known if it ever catered for travellers. It is 200 or so metres from a road Roy shows running from Lesmahagow to Stonehouse and about 500 metres north of the Roman road but any link with these roads would be tenuous without additional evidence. Lochgate, west of Drumclog. NS 6237. It could mean way to the loch (now drained) in which case it would have had local use only, or the way by the loch which is more likely as there was a route here (more or less on the A71 line) in the middle ages. 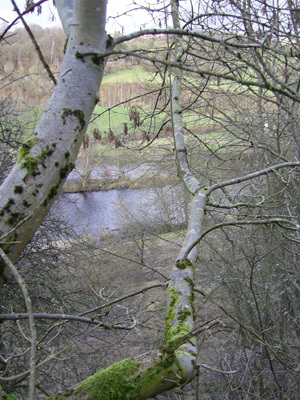 Near Auchlochan, between Lesmahagow and Coalburn. NS 8137. Given the absence of any roads passing through here on Roys maps, this ford may just have been of local use. Stockbriggs and Over Stockbriggs, 2 miles north west of Coalburn. NS 7936. If referring to a bridge or causeway it was likely of local use only. Roy shows no routes in the area. 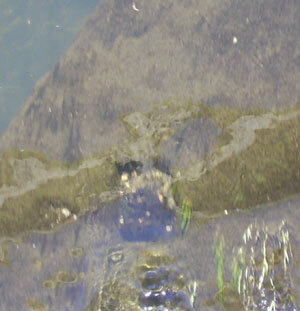 It is not clear if the name refers to a local ford near the village or down at the Avon. As said there, any route would probably be local. 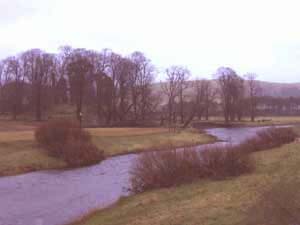 Crossford on River Clyde. NS 828 465. This was on the Hamilton - Lanark route, see Thomas Reid (op.cit. page 235). The bridge here dates from 1793 and prior to that time there was a ford and a ferry. There is a mention of a Crossford in the Liber Calchou (Book of Kelso) in the mid-1100's and that a road led to it but this appears to have been over the DouglasWater a few miles to the south. In 1650 it was used by Cromwellian forces. J B Greenshields in the Annals of Lesmahagow (page 40) has the interesting observation that a number of holes in the river bed seem to have been used for posts across which wattle panels would be laid to deepen the river and so allow the use of the ferry in times of drought. Nether and Over Corsfurd were on the east side of the river. Approximate location would be at Birkwood just south of Kirkmuirhill. NS 799 421. This was on or near the north- south route shown on Roy which may have existed in Ponts day, given his listing of the distance between Glasgow and Douglas. 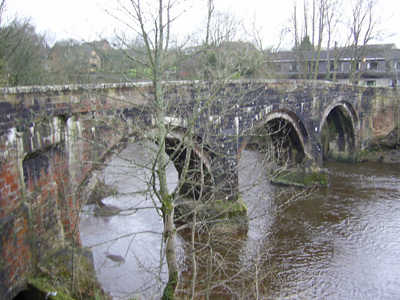 The bridge was on the early route between Glasgow and Dunbarton and was completed in 1577. This is not the "Roman" bridge as proved by the stream running from Milngavie to the Kelvin and the position of Kessington (NS 5671). The next stream to the east has a Fluchter nearby which suggests this crossing was just south-west of Torrance (NS 6173). Pont shows a Badhindrocht (drochaid, a bridge) nearby. There is a slight possibility that the crossing was the stepping stones shown on the 1925 1" OS map between Cadder and Balmore but against this is the fact that no such route is shown on Roy. There is also the possibility that the crossing was at the present day location which is shown on Roy. This is uncertain although a route north through present day Torrance to the Campsies and one coming from Kirkintilloch are suggestive. On Luggie Water in town centre. NS 6574. NMRS NS67 SE9. 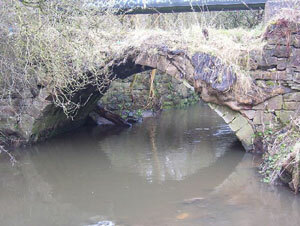 In 1672 an earlier ruinous bridge was replaced and is likely to be that shown on Pont. The crossing is shown on the road between Glasgow and Kirkintilloch depicted on this map and there seems to have been a route of sorts to Kilsyth.. Predecessor of Stockwell Bridge in Glasgow. NS 5917 6457. NMRS NS56SE 458. There was a timber bridge here from very early times as it was in a decayed condition about 1340. It was replaced by a stone bridge built by Bishop Rae in 1345 which itself was replaced about 1855. There was a nearby ford used in mediaeval times; however, the crossing shown by Pont was the bridge itself. The Renfrew maps shows the road from Paisley crossing this bridge but it would also have covered any other routes such as from Rutherglen or Cathcart. Bothwell Bridge. NS 7107 5776. NMRS NS75 NW8. Although the present bridge is said to be 17th century there may have been an earlier bridge here. Indeed Blaeu shows a bridge and the Pont original has the place name Clydesbrigh although his map is somewhat indistinct at the actual location. There has to be a presumption that it served both north-south and east-west routes. Molendinar Burn. NS 6064, NS 6065. He shows these two crossings aligned with the two main streets running east from High Street, probably Drygate and Gallowgate. This identification is supported by a map depicting Glasgow in 1547. The crossing nearest the Clyde is shown on the Pont original as a bridge with a short length of road to its east, the other may have been a fording point although this illustration shows a bridge was built at some time. Routes to the east are suggested. Tollcross Burn. Bridge near Tollcross. NS 635 634. The best fit would be at Tollcross or at Shettleston. If the crossing was at Tollcross this would have led to Hamilton and the south; if at Shettleston it would have led to the Monklands area. Bridge over North Calder Water near to River Clyde. It is hard to tell both from Blaeu and the Pont original if this was where the A74 crosses the North Calder or nearer the Clyde at the site of the no longer existing Old Calder Bridge. Both are shown on Roy. NS 6862. (See report by Robert Murray on West of Scotland Archaeology Service site). If it was on the main road it would have led to Edinburgh in Roys day. The alternative would have led to Uddingston and Hamilton by Bothwell Bridge. These possibilities are suggestive only and would need definite proof. Over North Calder, just west of A725 Bellshill to Coatbridge Road. NS 7262. Crossing near to present day Shirrel Farm. NS 7461. It is quite close to the above crossing. It may just have been of local use as the Shirrel is not a particularly significant burn. 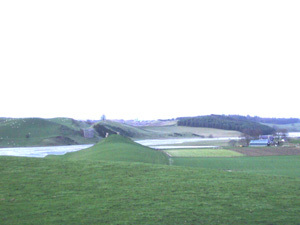 North Calder, near Gartness, south-east of Airdrie and east of A73. NS 780 644 approx..
Roy does not show a north south route here so it is unlikely to have been on what is now the A73 route. It is however less than two miles to Airdrie and may have been a convenient route for places south of the river to reach the town. 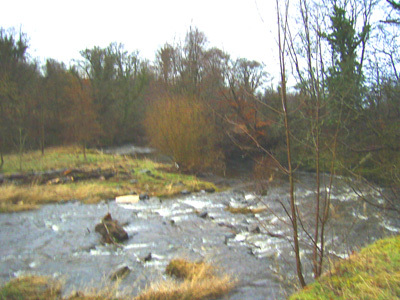 Over Luggie Burn at Bargeddie, 2 miles west of Coatbridge and just north of the A8. NS 706 637 approx. Given the north-south orientation of the Luggie Burn this could have been on an east-west route between Glasgow and the Monklands. It might also just have been local as Roys route is a mile north of here. Over South Calder near Jerviston and north of Forgewood - one and a half miles north of Motherwell. NS 750 587 approx. There is no nearby road shown on Roys map. 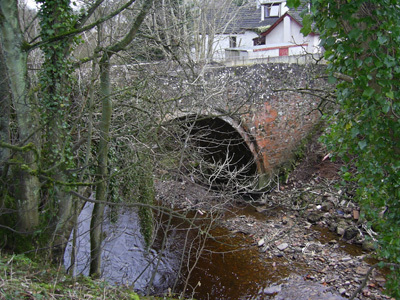 The omission of the bridge at Bothwellhaugh (given its supposed Roman age-see photo) suggests that this bridge was not linked with it as the Bothwellhaugh bridge would have given easy access to the Motherwell area from Bothwell Bridge. This leaves just the possibility of it being local or on a route from the Motherwell area to the north although this is unlikely when nothing is shown on Roy. Over South Calder near to Cleland House. NS 785 575 approx. Despite its approximate location this is at least a mile from the nearest of Roys roads with no particularly obvious function, except local movement. On South Calder, just west of Bonkle. NS 830 568 approx. Like the crossing below there are no links with any of Roys routes. It may just have been for local use. Auchter Water at Bonkle, close to above. NS 834 566. The implied route would be south of the South Calder Water which would lead to the Wishaw area and also to the crossing above. However, on Roys map the road from the east (a road leaves the Edinburgh - Glasgow road at Kirk OShotts and runs to Allanton and then Bonkle) terminates at Bonkle nor is there a road associated with the previous crossing which indicates any movement to the Wishaw area may just have been local. 18. On river just north of Lanark, near to confluence with Clyde. Mousemill Old Bridge over Mouse Water. The first mention of a (wooden) bridge here was in 1587. It was replaced with a stone bridge about 1649. NS 8694 4420. See NMRS NS84 SE3 and T Reids study (op.cit.) for further details as well as this old photograph when it was still in a reasonable condition. This is on the early Lanark-Crossford route which would have led to Hamilton and ultimately to Glasgow. Cleghorn Bridge over Mouse Water, east of Cleghorn. It had been thought to be Roman as a Roman road passes through here although it is more likely that it crossed at a nearby ford. Nevertheless there was a bridge here at least in late mediaeval times (it is mentioned in 1512-13) and certainly in Ponts day. NS 9047 4526. See NMRS NS94 NW3 and T Reids study (op.cit). 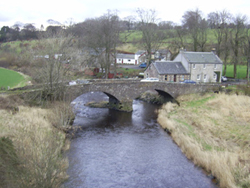 Pont shows a mill here but it would also have led to what was a main road in Roys day (partially following the course of the Roman road) up towards Carluke. Having said that there was a shorter route from Lanark to Carluke, as well as one to the east via Carstairs. Not identified, although Blacklands (shown south-west of Strongait) is at NS 671 707. Ford Bridge, 3 ½ miles east of Airdrie on A89 and 1 mile west of Caldercruix. NS 802 672. This is confirmed by Roy who shows Leadmanford. The 1:25000 map shows Ford Bridge and Stepends Farm. In Ponts day it was presumably a ford. On Roys map, at Caldercruix one mile east of the ford, he shows his road (from Airdrie) dividing with one branch heading to Avonbridge and Linlithgow and the other heading for Armadale and the east. This latter road could well be the road shown on Ponts Lothian and Linlithgow map that runs from Edinburgh through Bathgate to beyond Barbauchlaw (near Armadale). It may in fact be the line of the road the monks of Newbattle are said to have built in the early middle ages between Newbattle Abbey (near Dalkeith) over to their lands in the Monklands (Airdrie/Coatbridge area) - see The Road from Newbattle Abbey to the Monklands for more information. Regarding the other road, there is a mention dating from 1723 in McFarlanes Geographical Collections (Vol 1, p.318) of the Muir Road from Linlithgow bridge to Glasgow which is likely to have passed over this ford. Given Ponts inclusion of Linlithgow bridge and Avonbridge as well as the road heading past Armadale (strictly speaking, it is shown on Blaeu and not the Pont original so may date from the mid 1600s), it is reasonable enough to assume these routes existed at that time. Not identified. Perhaps near Kilncadzow NS 8848. 22. Hil, above Mouse Water in south-east of map. Hole, one mile east of Kilncadzow, near A721, NS 898 481. Although noted on Blaeu and the original manuscript map as Hil, it is shown as Hole on Roy and later maps. The likelihood is that is from Heol, early Welsh for a road, as it lies on the Roman road. The Roman road north of Castledykes heading towards Carluke. Auchter water at Bonkle. NS 8356. 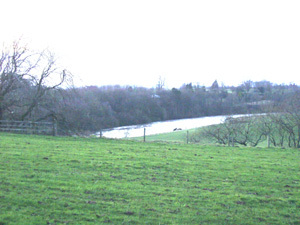 Hyndford, on River Clyde, near Lanark. NS 9141. 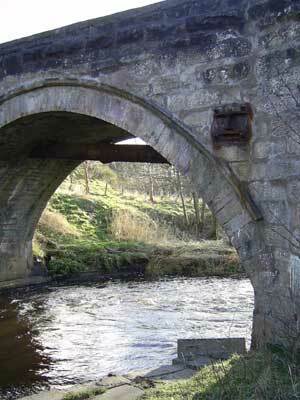 T Reid in his study of river crossings near Lanark details various fords and ferries in the vicinity of Hyndford. The use of the place name indicates the presence of a ford before Ponts day and probably during it. The most likely use of the ford would have been to travel between Lanark and Biggar and possibly Carnwath as well as the upper reaches of the Clyde valley. Crossford. NS 8246. Again, Reid (op.cit. p.235) details the crossing point here which seems to have been an early one on the route between Hamilton and Lanark. The bridge was built in 1793. Identification Old ford over Carnwath Burn, just west of village. NS 975 466 Wath is an Anglo-Saxon word meaning ford and it is thought (see for example NSA - go to non-subscriber, browse scanned pages) that the ford was just west of Carnwath over the Carnwath Burn. The presence of the motte so near to this ford may indicate it was partly sited there to control movement using the ford. Associated route By Roy�s day Carnwath was on a number of main routes leading to Edinburgh, Peebles, Biggar, Lanark and Carluke. While not definite it would seem reasonable to assume the ford was used in Pont�s day by the Edinburgh road (shown on the Lothians sheet as running on the north side of the Pentlands) and by routes going to Carstairs and Lanark. Identification Spittal, one mile south of Carnwath. NS 988 450. Stonypath, 1 mile west of Dunsyre. NT 0548. This also appears on the Lothians sheet where it is placed above the road depicted on that map which runs from Edinburgh to (presumably) Carnwath. Roy shows the same route quite clearly but again the present Stonypath is about one km north of the road. The name itself is very old appearing as Staneypethe in the Register of the Great Seal of Scotland in 1411. Associated route On balance it probably relates to the Edinburgh road (even an earlier course of this) rather than a north-south route as shown on recent maps, as this track only appears from 1868 (see 6"map, sheet XXI - centre left bottom of sheet) onwards. 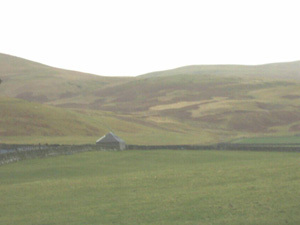 Spittal, 2 miles east of Biggar near Skirling. NT 069 384. Associated route Again, it is hard to say if this was just a hospital or if it served travellers as well. However, it is very close to a route shown by Roy that led to Edinburgh and also to the route to Pebbles through Broughton and Drumelzier. In addition it was sited very close to where these routes crossed the stream. Identification Crawford. NS 9520. The NSA gives an interesting etymology as the road or passage of blood referring perhaps to the passage of Roman roads through Crawford although the more likely derivation is crow ford. The ford was very probably in the very centre of Crawford (see 6" map - sheet XLVII NW corner of sheet) where the Roman road from Nithsdale crossed the river to join the road from Annandale. Associated route The fact that the Roman road from Nithsdale crossed here shows the antiquity of the ford and it is likely that the motte at Crawford was placed nearby to control a strategic route between north and south. Having said that it is not clear what the status of the ford was in Pont�s day, particularly as there was another ford at Roberton just north of here. Identification It is hard to identify these although it is likely that they refer to a crossing of the Douglas Water or the Poniel Burn, somewhere near Happenden, north-east of Douglas. Forrest�s map of 1816 shows a Bridgend on the old road that crossed Broken Cross Muir (NS 853 352) but Roy shows nothing in this area so the Bridgend may just refer to a bridge built on this road well after Pont�s time (see Poniel Old Bridge, NMRS NS83 NE49). Associated route Probably north-south but further evidence would be needed to say anything more positive. Identification Hyndford, 3 miles south of Lanark on River Clyde. NS 9141. Identification Crookboat. NS 900 396. This was one of the ferries mentioned by T Reid (p.221) in his study of river crossings near Lanark. Associated route It would have led between Lanark and Douglas and other routes to the south. 9. Neth. & Over Baithils, opposite Mouse Water and west of Lanark. Identification These names must be associated with the old Clydesholme ferry or boat which was just upstream from the present bridge at Kirkfieldbank. T Reid (op.cit. p.223) gives details of the ferry which was first mentioned in 1491. Located approx. NS 8743. Associated route Reid notes that this was on a very old route between the Lothians and Ayrshire, as well as Galloway. Associated route Probably Pettinain to Lanark rather than Biggar to Lanark. Identification This is on the Pont original but not on Blaeu. It is sited at NS 892 405. It was an important crossing used to bring coal and peat from the Douglas area into Lanark. See T Reid, (op.cit.,p.221). Associated route Lanark to Douglas and area. Identification Wolfclyde, one and a half miles south west of Biggar on A72. NT 020 362. Reid (op.cit.,p.215) suggests this derives from Wathclyde where wath has the meaning of ford. Associated route Although Reid says that it allowed access to Carmichael, Symington and the Douglas district this was probably at quite a late date as no road is shown on Roy. Nevertheless, the antiquity of the name suggests it was used at sometime perhaps to give local access to Biggar in the middle ages.